Dell and EMC are well-known brands in the IT infrastructure market providing a range of products and services that covers almost any technical requirement. The merger of the two companies to form Dell EMC has created a giant company that covers the IT industry. In the physical security world, especially in the surveillance industry, Dell EMC has a long history of providing the infrastructure to support a surveillance implementation, from storage to servers, network switches and so on. To find out more about what combined company can do for the surveillance market, Hi-Tech Security Solutions spoke to Jason McGregor, a recent addition to Dell EMC in South Africa. McGregor is well known in the security and surveillance world, having worked for some of the leading brands in the industry before making his move to Dell EMC. While Dell EMC is not a competitor to security companies with its own camera brand or VMS (video management system), McGregor explains that it partners with these companies to provide an integrated solution that provides all you need to link the camera to the control room and to a third-party VMS. Explaining further, he says Dell EMC has seen the surveillance industry start its move to the data centre. By this he means customers don’t want cheap-and-nasty storage products when it comes to surveillance, they need to know that when they need footage it will be there. Moreover, as video analytics and artificial intelligence become more important in the industry, reliable and fast access to video data is critical. In other words, we’re now talking about mission-critical systems. 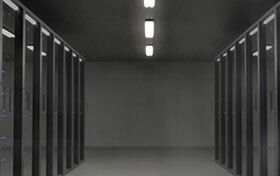 In this regard, the company has a full set of solution for data centres, from cloud solutions to what is called ‘private cloud’ solutions – where the data centre is hosted on the user’s site. It can also cater for hybrid cloud solutions, combining both of these to allow companies to keep certain data on site while other data is stored remotely, depending on its importance or utility at the time. For the surveillance market, Dell EMC can support whatever architecture (centralised, decentralised or cloud) the client requires and whatever VMS is required. Looking at the storage market alone, McGregor says Dell EMC is focused on making storage as easy to use as possible. Its solutions don’t only offer hard drives in a box, but are focused on providing the full storage solution. In terms of scalability, systems such as the Isilon network- attached storage (NAS) devices can scale to multiple petabytes (1 petabyte is 1024 terabytes). He says this is real scalability as it is not simply a matter of more drives, but each Isilon NAS includes its own processing power, controllers and cache (as well as hard drives), making sure performance is not degraded the more storage you add to your solution. When it comes to the control room, Dell EMC also provides a full set of solutions (in addition to the storage and servers mentioned above). McGregor says the company supplies workstations, monitors and even video walls and UPSs. It is also worth mentioning that VMWare is part of the Dell EMC group. VMWare allows companies to divide their servers into virtual servers dedicated to specific functions, with the ability to add or remove features (CPU, memory, storage etc.) as required. This plays well into the surveillance market as video requires a lot of storage space, but if you are simply recording video from multiple cameras, your CPU requirements are lower than they would be in a traditional computing function. Additionally, RSA is also part of the group and offers a host of security functionality, including encryption of data at rest. If this is not important to customers in South Africa right now, it will soon become important when the PoPI Act comes into force. Another area in which Dell EMC will find itself welcome in the surveillance market is that of open standards. More than storage, Dell EMC is pushing open platform standards, including open storage, computing and networking standards. The reasoning is that with this approach, the surveillance user will be able to use any open management software on the platform, sure that it will run without requiring proprietary hardware. Customers can then choose best-of-breed products that meet their requirements with the assurance they can run and be managed on Dell EMC servers and networks. While it is not unknown for companies to claim that their solutions run on any hardware, Dell EMC goes a step further through its Validation Labs. If a customer wants to know exactly how their full surveillance solution will run on a Dell kit, McGregor says these labs will set up the solution and test it to failure. At the end of the testing and configuration process, a validation certificate is issued that will provide the customer with peace of mind that the solution will do what they require. McGregor says Dell EMC engages the local market at all levels, distributing its product via a channel while also engaging directly with end users with its system integrators and other partners. It also provides training certifications to partners to ensure they install and configure the product to standard. The reason for this is Dell’s support programme. Users who are on the Pro support plan are assured of 24-hour on-site support. Moreover, Dell EMC provides an application to these users that monitors their equipment and can tell when a component is about to fail. When it detects a faulty or soon to be faulty component, Dell and the client are notified and in many instances the component is replaced before it fails and before the customer is aware of a problem. Dell EMC’s OEM division is another part of the company that benefits security and surveillance users (see www.securitysa.com/55695n). Some well-known VMS manufacturers use Dell EMC hardware rebranded as their own because of the quality of the products and the testing it goes through. If one looks at the OEM business Dell EMC does in the security market, it may even hold the lead in market share for surveillance storage solutions, but under different brand names. As a final thought, McGregor also notes that Dell EMC offers its financing service in South Africa now. This allows customers to purchase their infrastructure solution and pay a set monthly fee for it instead of having to make a large capital investment. As IT solutions become more critical to the security industry, Dell EMC has set itself up as a one-stop shop for all your infrastructure needs, even going as far as pre-testing products to ensure they work optimally on the company’s equipment. The LanDynamix fully managed IT security stack ensures that all the main attack vectors typically used by hackers to breach a network are protected and proactively monitored. Kaspersky Lab joins forces with industry leaders to deliver actionable technical guidance for multiple IoT stakeholders. New converged solution by G+D Mobile Security integrates SIM and other security applications on a single chip.